Note: check out our OpenSprinkler DC-powered version, which uses an innovative circuit design that drives sprinkler solenoids using DC-only voltage. I often get questions about sprinkler valves, so in this post I will explain the basic electric properties of sprinkler valves. If you are designing a sprinkler controller circuit, understanding these properties can be helpful. It’s a common mistake to assume sprinkler valves work with DC voltage. While most valves indeed CAN be powered by DC voltage (see below), they are designed to work with AC voltage in the range of 22VAC to 28VAC. That’s why if you look at a standard sprinkler transformer, the output is usually AC. The electric part of a sprinkler valve is the solenoid — it’s a cylindrical-shaped thing screwed into the valve. At the center of the solenoid is a rod supported by a spring. The solenoid has two wires connected to its internal coil. Applying 24VAC on the two wires energizes the coil, and causes the rod to contract into the solenoid. This releases the internal water pressure thus opening the valve, allowing water to flow through the valve. Removing the voltage causes the rod to revert back to its original position. This allows the water pressure to build up internally hence stopping the flow. Because closing the valve relies on internal pressure build-up, it usually takes a few seconds to completely stop the water flow. This also means if your water pressure is too low you may not be able to completely stop the water flow. 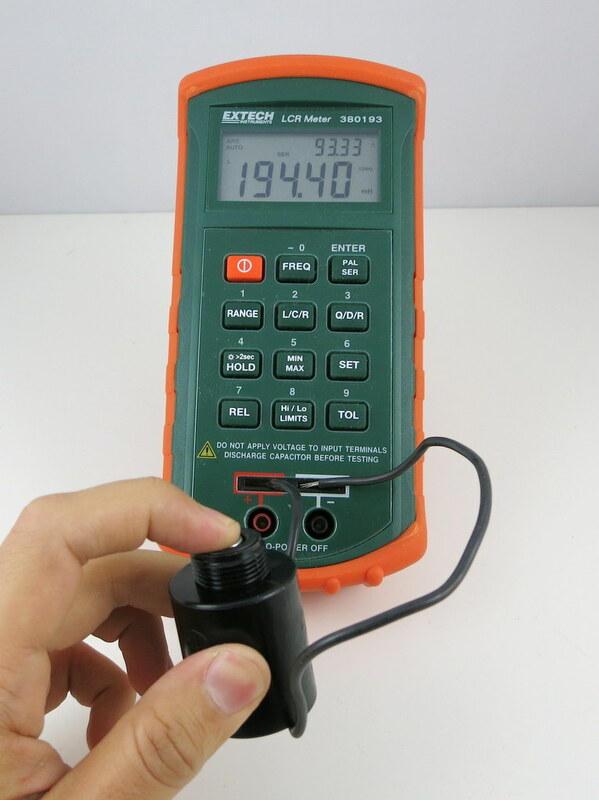 Let’s start by measuring the resistance of the sprinkler solenoid. I have two example solenoids, one made by Orbit and one made by Hunter. According to the multimeter, one measures 32.3 ohm, and the other measures 24.1 ohm. So the resistances are pretty low. If you think about it for a while, you might realize something is not quite right here: if we apply 24V on the solenoid, wouldn’t that produce a 24 V / 24.1 ohm = 1 amp current draw? That’s quite steep. In fact, my sprinkler transformer is only rated 750 mA output current, so it can’t provide enough current to drive even one solenoid?! The catch is exactly in the fact that sprinkler solenoids are powered by AC voltage. Because the solenoid is made of a coil, it not only has coil resistance but also inductance. When operated on AC power, the inductance produces significant reactance which cannot be ignored. You can read the Wikipage to find out how reactance is calculated, but basically it has to do with the frequency of the input voltage, and the inductance of the coil. Because inductors ‘prevent’ current from changing rapidly, it behaves like a ‘resistor’ under changing current (i.e. AC). The higher the frequency, the higher the ‘resistance’ (i.e. reactance). Note that the reactance counts into the imaginary part of the impedance. Using complex numbers is just a convenient way of denoting not only the magnitude but also the phase. For example, when you apply a sinusoid voltage on the inductor, the corresponding current is also a sinusoid wave, but with a different phase. Using complex numbers, the calculation can be carried out quite easily. The readings are about 0.2 amp. I suspect the difference comes from the measurement of the inductance. On my LCR meter, which can measure inductance at two frequency levels: 120 Hz and 1 kHz, I find that the inductance is measured differently under the two frequencies. Because the actual operating frequency of the solenoid is 60 Hz, and my meter cannot measure 60 Hz, the inductance I am getting is probably somewhat off. That should explain the difference between the calculation and the actual current reading. The 0.6 amp current we calculated above probably explains the inrush current: when the solenoid is just energized, there is an impulse current that’s typically higher than the holding current. This is because the rod is still out, and hence the reactance is lower, causing a higher current than when the rod is attracted in. From the calculations above, it’s obvious that the coil inductance is important at limiting the operating current when the valve is powered under AC. What about if we power the valve under DC? Obviously we shouldn’t use 24VDC, because that would draw too much current (0.75 to 1 amp). If you search online, you will find plenty of posts talking about powering sprinkler valves using 12VDC. This actually works well in general. Using 12VDC has advantages in that 12VDC power adapters are cheaper and much easier to find; the circuit design is simpler, and you can use the same circuit to interface with other DC devices like relays and motors. In contrast, 24VAC power circuits are more complex and you can’t use the same circuit to directly interface with DC devices. However, you should be aware that because the sprinkler solenoid’s resistance is pretty low, the operating current under 12VDC will be relatively high, around 400 to 500 mA. This more than doubles the 200 mA operating current (rms) under 24VAC. Also, the coil will heat up more, and this potentially shortens its life. For example, under 12VDC, the Orbit valve above will dissipate 12 * 12 / 32.3 = 4.5 Watt; whereas under 24VAC, the same valve only dissipates 0.2 * 0.2 * 32.3 = 1.3 Watt (note that only the resistive portion dissipate power, inductive portion does’t). Again, the issue is that under DC there is no reactance, so the coil’s inductance plays no effect at limiting the current. What if we reduce the voltage further to 9VDC, in order to reduce the operating current? After all, the solenoid only needs 200mA holding current to remain activated. Unfortunately that won’t work: I’ve tried powering solenoids with 9V, and I can’t get the valve to reliably energize. 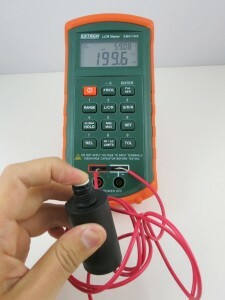 The problem is that 9V is not sufficient to provide the required inrush current, so the rod cannot get fully attracted in. However, if the rod is already in, 9V is sufficient to hold the solenoid activated. So if you really want to make it work with 9V, you need a circuit that can provide a high impulse voltage; then once the solenoid is activated, you can lower the voltage to reduce the current (hence power) consumption. A possible solution is to use a boot converter (very much similar to circuits for latching solenoids) to provide an impulse high voltage, but this comes at the cost of increased circuit and software complexity. Thanks. Really helpful to know this. I want to dabble more into these toys but afraid I’d be a lifelong student without only equations and no projects under my belt. Glad you are here to somewhat bridge the gap. Have a koi pond and working to keep its waste water from thrown down the drain and instead be used to irrigate the garden. Got my pump requirements figured out and setting out to lay the pipework. Then will I install drip tapes and what not and manually turn them on and off. will then jump into getting your controllers and valves. Guaranteed fun stuff as long as I don’t attempt yet to assemble them together! This may sound a bit odd but I have a situation where I want the irrigation to turn on when the temperature drops to freezing. While there are lots of products that will shut the system down at freezing temperatures I cannot find a ready-made device that will turn it on. Can I just use regular thermostat that produces 24 volts to control the valve? If not, can you please suggest how this might be accomplished. Yes you can. Most thermostats work with 24VAC system, so all you need is a thermostat, 24VAC power supply, and your sprinkler solenoid. Not odd, smart! Water crops to save from freezing. Great idea! Thank you for a very accurate and informative article. I am interested in the use of DC for my 24V AC Orbit sprinkler control valves because of long power failures we have. I want to use a 12V DC backup to drive the coils during power failures. (I was planning to use a DC to DC switching supply, to provide the 24V DC to drive the coil, but your article has put me on the right track). Thanks again, you have saved me the time and effort of experimenting and I now know exactly what I can and cannot do. My suggestion is to apply the boosted 24V DC momentarily to open the valve, once the valve is open, you can keep the voltage quite low (I’ve used 5V and that’s sufficient to keep the solenoid activated). Don’t apply 24V DC persistently as that will burn out the solenoid. Could you use a 12V DC to 120V AC inverter commonly found for run AC items in a car to just power the sprinkler timer from a bank of batteries? Perhaps look into some of the solar energy to AC parts if a higher quality AC signal is needed. You probably can. But as I mentioned in the post, mostly the solenoids will run just fine on 12V DC, so there is no need to convert it to 24V AC. I have not tried it, but I am convinced it should work. If you follow ohms law, you could add a resistor in series with the coil to reduce the current. Thus if the coil of the solenoid has a resistance of 32ohms, I would add a resistor of 16 to 32ohms (you will have to try) to limit the current. This will work simply because the coil has an infinitely high resistance until energized. Thus the voltage drop over the coil will be much higher than over the resistor initially (series resistors theory). You will need a high wattage resistor 200mA x says 3V (estimated voltage drop over resistor) is 600mW I would use a 2Watt resistor to make sure it does not eventually burn out, cause a fire or fails. Please note, if you use electricity, the onus is on you to understand, read and ask questions and make things safe. Adding a fuse in series, of 1 or two amp rating will so no harm. Solenoids, transformers and resistors heats up. If you modify circuits (use an AC valve with DC) you should make it safe. Have fun experimenting, reducing current causes less heat! Just ran across this info — have a brand new rainbird inline valve that runs at 24vac. Been in electronics all my life so just put a 24 vac control transformer (20va) on it to test it and it chatters bad. (which usually means something needs dc in my mind) BUT, is this typical? Do they NEED water pressure before you apply the 24vac? Never messed with irrigation stuff before. Since AC is 50 to 60 Hz, it’s typical to hear chattering. You can, if you want, power the solenoids by 12V DC, but electrically the valves are designed to work with 24V AC. Very informative, but i have the opposite problem. I want to use a standard 24 V AC timer to operate a DC (12 or 9 V? http://www.lowes.com/pd_904-74985-27757_1z0wg76__?productId=3047175&pl=1 valve) since it has hose threads on either side. Is this easily doable? This implies that the timer simply switches the power to the zone without any further power conditioning, i.e., to test a solenoid (or valve) I can short a zone to the transformer power directly, bypassing the timer, and listening to the water flow. I have a blown fuse in the timer, and a solenoid short (among other possibles) can cause this, but now I can actually test each zone to see if the valve opens up without opening up the valve box. As a precaution, I will use an ammeter between the power source and the zone point to see when the current spikes (so I also don’t burn something else out !). If there is something wrong with this logic, I would love to hear about it. Obviously by inserting a new fuse and trying it on the timer, can accomplish the same thing, but based on what the problem actually is, can cause me to blow several fuses and then not really tell me what I want to know, whether it is the solenoid or the timer, for example. But for now, a blown fuse is more indicative of a shorted solenoid than anything else. 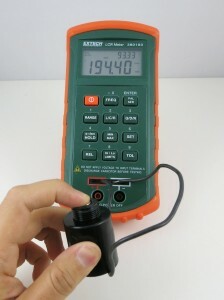 Do you have any understanding of the relationship between water pressure, and required current for activation? I don’t think there is a strong relationship between the water pressure and the required current. Most sprinkler valves require sufficient water pressure to properly turn off / close, otherwise the pressure can’t built up internally to close the water flow. Also the inrush current, which is needed to energize the valve initially, it typically higher than the holding current, but it has nothing to do with water pressure. Can you use Orbit solenoids on a rainbird controller? They are all new. As long as they are the same type: if the controller is 24VAC controller, then you should use 24VAC solenoids (manufacturer doesn’t matter). If the controller is a latching solenoid controller, you should use latching solenoids. Very informative so I thank you for that. I have a problem with a Hunter system and one sector was not working so after checking the wiring and verifying I got 24 V at the valve I presumed the solenoid was faulty and replaced that but the sector still does not work. I notice that when the sector is selected and the solenoid energised the voltage drops off and the valve does not open to allow water. The valve seems fine mechanically as if I open it a 1/4 turn I get water in my sprinklers. Any suggestions? could it be that there is a bad connection somewhere and when load is out on the cable – even the 0.3 Amp when the solenoid operates – this temporarily breaks the connection? When you say the voltage drops off after the solenoid is energized, how much does it drop off? It should still be somewhere around 24V AC. If it’s significantly lower, that means there may be shorting somewhere (likely the wires that go from the controller to the solenoid). can I use connectors from a 12 or 6 votl battery? or from the cars lighter.. alligator clips? I’ve used 2 9V batteries wired in series for an air cannon with the 24V sprinkler valve. It works ok, However, I’ve found that a manual ball valve works much better, it opens quicker and you get more airflow. if for some reason after the transformer ,the feed-in power to the control is read 29.6 instead of 24 ,will the system still be able to run ? Yes, it’s fine. It’s normal to have a no-load voltage much higher than 24. As soon as the circuit starts to draw current, the voltage will drop. Also, solenoid valves typically can withstand higher voltage, at the cost of possibly reduced lifetime. I have an older Orbit controller model 57006.Lately when I put the sprinklers on they start when they feel like and also shut off same.Checked power out of transformer 29volts,checked power on each of 5 zone wires leaving controller,looks good.So I figured I must have problem with ground wire since problem exists on all zones.A couple of times when I moved wires by valves(all in one location) it would come on,but not always.While investigating situation i found some sort of cylinder shaped 1″plastic items with three connections,only 2 used,in line with each ground wire from one to the next.My question is what are these things and do I need them or can I eliminate them as a possible source of problems,and just connect ground wire to each valve? It will help if you can post a picture (such as uploading it somewhere and share the link). I don’t think I’ve seen this 1″ plastic items with three connections as you described. It might be part of the transformer, might be something else. A picture would help. Nothing turns on in automatic or when I manually turn on zone 1. I get 28vac from common to zone 1. Im also getting 28vac on all the rest of the zones but I only have zone 1 turned on. If I disconnect the other zones. They no longer have 28vac power on the timer terminals and they have 27vac on the wires for the zones. I tried the timer with tstat wires only to the closest valve and it worked. What is causing my system to back feed the 28vac? instead of using your controller or any oscillator to make DC intervals that can create the frequency you need for low consumption that you get in AC. it just involves a MC34063 as boost converter, and two MOSFET high side switches. Second, converting from DC to AC is a *much* more difficult task, especially if the solenoid draws a fair amount of current from AC. You can’t just turn DC on/off with an oscillator at 60Hz, because the waveform you get would be completely different from the sinusoid waveform of AC. Generating sinusoid waveform from DC is difficult, and being able to supply a large amount of current is even more so. Following this thread and not being smart in the relationships for electrical circuits, I am trying to figure out if a Madison M8000 float switch inserted between one wire of a sprinkler solenoid will handle the voltage (13.9 on Multi) and the amperage (.2)amps. So with my limited understanding, it looks like the switch will work and not burn out if I simply insert it between the solenoid and the controller via the common wire. I’ve ordered three ( In case they burn out in my testing) to try and rig an auto fill system for my pond. The idea is the controller timer will command power to the solenoid 6 times a day. If the float switch is up (water level acceptable) then the circuit remains open (via the float switch) and the valve does not open. If the float is low, the circuit would be closed and the valve will open for the programmed time. Why do it like this? My pond can handle city water input in small amounts and this will avoid killing fish due to continuous influx of city water in case a float switch fails. The auto top off is a convenience for me vs. the need to make sure the pond is always at a given level. I want to connect a AC-DC adaptor to a motion detector security light socket to operate an electric sprinkler valve. I want to scare away deer from my garden. I’ve read the earlier replies, and understand there is a burn out problem. If your sprinkler valve is a standard 24V AC valve, you should use either a 24V AC adapter, or 12V DC adapter. 22V DC is too high. If you choose the 24V AC adapter, then as you said you need a AC-DC converter if you intend to power the motion detector from the same power source. On the other hand, if you choose 12V DC for your valve, you can use a simply linear regulator like 7805. Of course if you don’t mind using two separate power adapters, you can always use a 5VDC power adapter for your circuit, and 24VAC for the valve. Thanks for the great explanation. I already have a rasberry pi with a few relay switches that i’ve used to control stuff like garage door opener etc. I also have an existing electronic irrigation controller that’s pretty basic (really old). However, it has a button to manually start the sprinklers. I’m thinking of setting up the circuit in a way that i can control that button press with my relay. That way i can effectively control irrigation circuit with the PI. Any suggestions on things to watch out for? Have you checked out our OpenSprinkler Pi? (http://pi.opensprinkler.com). I enjoyed the above article, it gets down to the nitty gritty of DC voltages. I am using a 15volt AC 300Mah xformer with an unloaded voltage of 17V AC. It runs system great no problems engaging orbit and rainbird solenoids, the orbit is 100′ away using 22gau wire on top of it. I like this Xformer as it very efficient and has less than a watt resting current and not a IV class either. I am probably a volt or 2 away from these solenoids not working, but all has been well for years. Thought you may find it interesting…I wonder if putting in a class V 12v 1 amp DC would be as good, resting current should be better, but ultimately higher operating current. BTW 1 watt 24/7 at 10cents kwh is about 1 dollar per year. I’ve read online that 12V DC is generally sufficient to drive typical 24V AC sprinkler valves. Technically, 12V is a bit on the low side for providing the impulse current, and a bit on the high side for providing holding current. That’s why the circuit in OpenSprinkler DC uses a booster to boost the voltage up to 24V, providing sufficient impulse current, then disables the booster and drops the voltage to 9V to provide holding current. This completely depends on how the circuit is designed. Generally, the circuit itself can be powered with 12V DC no problem. However, most sprinkler controllers (including OpenSprinkler AC version) uses triac to switch solenoids. Triacs can only switch AC current and not DC current. Specifically, it can turn on the DC current but will not be able to turn it off. This is because triac turns off at the zero-crossings of the AC current. DC does not have zero-crossings, so it can’t turn off. As a result, you most likely have to replace the triacs with DC transistors or MOSFETs in order to use DC voltage and still be able to switch the valves. You might sense a numb feeling on your fingers but it’s very subtle and it’s only when you touch both wires at the same time. 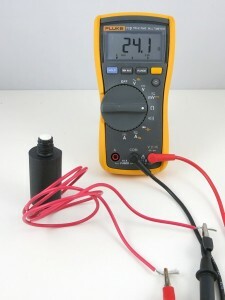 24VAC is considered low-voltage. However, since it’s AC, the peak voltage can momentarily go beyond 36V which is considered the safe voltage. I have a case where I want to operate a sprinkler valve in a remote location where running a powerline would be difficult. So, my solution is to use a solar panel. Originally, I was designing a PWM DC to AC converter using a MOSFET H-Bridge. But, halfway into the design the thought came to me: “Is it really necessary to use AC?” A Googling brought me here. Faced with the ambiguous answer, I had a flash: A solar panel of the correct configuration, might be able to supply the startup current and yet rollback for the holding current. I selected a Monocrystalline silicon solar panel [from Electronic Goldmine] with the following specs: Vmp 18V, Imp 190ma, Voc 20.7V, Isc 210ma, Pmax 3.5W. I tried it today at high noon. It quickly opened the value and held at 240ma! I plan to use a PIC MCU to control the value and also monitor the voltage on the panel. The only battery needed will be a 3V backup battery to keep the MCU running when there is no power from the Solar Panel — the MCU will sleep most of the time, waking only to test the solar panel for power. I might even be able to use a SuperCap instead of a battery, depending on how low I can get the standby current — and with the latest uWatt PICs I can get it pretty low! If your solar panel can output at least 5V, or even 12V, you can use the OpenSprinkler DC or a similar circuitry to operate sprinkler valves. Basically OpenSprinkler DC has a boost converter that bumps the input voltage to 24V momentarily to energize the valve, then drops it to input voltage (5V to 12V) to provide holding current. I’ve had it running for about a week. Well, the valve failed. It now has intermittent action and often sticks open! Not sure if running it with DC current is what caused it to fail. I designed a circuit that uses Pulse Width Modulation [PWM] to convert the DC from the solar panel to a fairly clean AC signwave (24 steps @ 31kHz, filtered with a hefty dual 18mH inductor) with enough power to drive the value. The valve hums slightly the way it does with 24VAC from a mains connection. I bought a new valve and so far, it works great. Based on what you’re saying, it sounds like the valve failure was coincidence. You are current on your electricity! I am planning to use the RainMachine (24V AC with max 600mA) to operate a couple of sprinkler valves. But also, I want it to trigger a 24V DC 350mA lock (a quick opening of a latch to release the content of a feeding box, so the current is just to trigger, not to keep open). The RainMachine guys say it would work. Also, I can not find anywhere the answer to: how far from the RainMachine panel can a valve be? In other words, how long can the cable be and still operate properly? Generally that depends on the resistance on the wire. For longer distance, you probably want to use thicker wires. And, wadaya know. The documentation recommends 18 gauge for runs less than 800ft, else 20 gauge. 350mA is the same as .35A, because ‘m’ or ‘milli’ means one-thousandth. And, 350mA/1000 = .35A — same thing for the 20,400mΩ to 20.4Ω conversion and the 7100mV to 7.1V. In the 18 gauge calculation, I doubled the distance for 2000′, instead of doubling the resistance, later — same difference. Can we use 24 VAC controller to turn on DC latching solenoids? You seem very knowledgeable. Question: I had three stations running off a valve and head toro system. ie…like a golf course or a large park. Manual function was fine. Comm didn’t work. I replaced all three solenoids. Still nothing. I traced the power and the comm. All seemed good. I always got 24 v when solenoids were not attached and the com seemed fine. When I attached the solenoids I lost all power. Out of last resort I replaced all solenoids again. It worked. Are not all 24vac solenoids the same for all valve and head for Dt50’s? I have no idea how I solved this problem? You should find out if the solenoid is 24VAC type. Generally 24VAC solenoids have a resistance between 22 to 50 ohm. If the resistance is much lower, it’s most likely a latching solenoid and it cannot be used with 24VAC controller. I have a small nursery with 9 24V AC Orbit valves and a controller that must be wired thru a GFCI outlet. The breaker can and has been unwittingly tripped, cutting off the controller, which kills baby plants. I found Hunter makes a hybrid controller with a solar panel option that will continue running if cut off, but it operates DC valves. Is there a way to make the two work together? I’m told the valves open but then close again immediately, which is holding voltage I gather here. If not should I try Hunter DC solenoids on Orbit AC valves – or is that a silly idea? Last idea, does Orbit make a DC solenoid for their AC valves that works with Hunter controllers? Otherwise it’s 9 new valves… thanks! I really don’t know. DC solenoids have two types: latching and non-latching. You need to find out which type it is, and what type of solenoid the controller can handle. Many DC solenoids I’ve seen are latching type, and are typically used in battery-powered controllers due to their power efficiency. I have a similar question to David’s. I have Orbit valves which I assume are AC valves as the controller is plugged in and I don’t see a transformer. (Is there an easy way to know for sure?) I have new puppies that dig up the cable, so I want to get the Hunter battery operated controller that I can place right by the valves (all four are together.) Since it requires DC valves, can I replace the AC valves with DC without having to buy all new valves and replumb them? Most AC solenoids have resistance between 22 to 50 ohm. So simply testing the resistance should allow you to tell. DC latching solenoids have resistance generally below 10 ohm. So I’m sitting with the current situation and hope someone can help answer me… this will be my best explanation! Its a water pipe that splits to 2 pipe lines, both pipe lines cannot be open at the same time as the water pressure drops so one pipe needs to close while the other pipeline opens… so there must be a constant flow of water. The one solenoid valve is wired positive, and the other solenoid is wired in reverse. if I provide power separately to each solenoid then it works hundred percent? Is it shorting and only letting the one open? How can I get this to work? Should I place a diode in line? Hope this makes sense and someone can help me! Sir , my doubt our system are installed 120 v -24 v transformer but in the field we are checked cable 32 or 36 voltage next some time solenoid coil we seen on top crack and function afterwards change coil it is working , what is reason for coil crack on top. Coil heating due to over voltage, perhaps? A tree in our yard was recently hit by lightning. The next day, I discovered our irrigation system wasn’t working and I was unable to turn on the controller. I started the troubleshooting process and found I needed to replace the transformer (AC wall adapter). With power to the controller, the system still didn’t operate correctly (two zones came on at the same time and the module for zones 1-4 started smoking!). So, I started troubleshooting again and was advised to test the resistance to each zone. 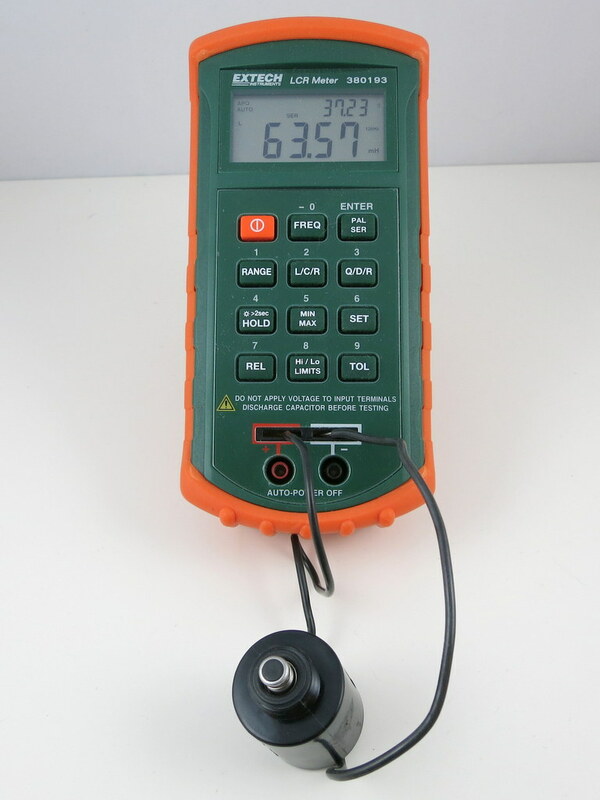 However, the ohm meter produces a wildly fluctuating reading for every zone (there are 12 total) in the system. There isn’t a single zone that has a steady reading. Any ideas? My fear is that the lightning affected the common wire and I’ll have to spend either a significant amount of time, or a significant amount of money to find exactly where the problem is. If the circuit is damaged by lightning, it’s possible that the triacs are damaged resulting in them losing control from the microcontroller. 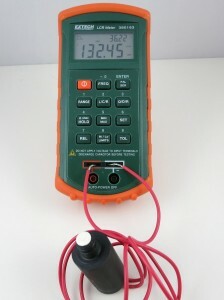 To avoid the circuit affecting the measurement you should remove the wires from the controller and test resistance again. Hey. I have an issue where a zone isn’t working.. so I am trying to replace the valve. The System is a Hunter.. a Hunter controller and Hunter valves (24vac). I replaced the valve with an orbit (24vac) but it doesn’t work. I successfully test at 24 volts when energized. I’m not sure why the valve isn’t opening. I am interested in using a sprinkler valve to control output to a pool slide. Right now we have to screw a hose into our outlet in the pool and my wife and kids have a hard time getting it in there. My idea was to throw a sprinkler valve in the discharge line so I could just put a switch poolside. Problem I am seeing is that most sprinkler valves are normally closed. I could run a normally closed but it would be energized more then it would be off and I worry about life expectancy. They do make normally open valves but they are a lot more expensive. Is it ok to run a NC valve open 95% of the time? I think it’s fine. Other than it would increase your electricity bill slightly, I don’t think there is any problem running it open most of the time. Hi, I was replacing 3 valves , when it came to wiring it was mess in place. There is a bundle of smaller wires, one thick white wire and one thick red wire. didnt work either. Any ideas ? What should I check ? Your best chance is to take a look at the controller side and see what colors you got wired to zones and commons. If you have a multimeter you can figure out which wire goes where, even if the colors in the controller box differ from those of the valve box. The thick wires will most likely be commons, while the others will be the independent zones. Many controllers have multiple common wire outputs, maybe the guy who set up the system simply put different colors for the different commons in order to split the current in two. I don’t know how many valves you have in total, but I suspect half of them were running with the thick red as common, while the other with the thick white as common. I always take photos before I split cables or harnesses, just in case. Thanks for the info. I have a question hoping you can help. I have a hunter system powered by 24v. I was having a problem burning out solenoids every couple weeks. I had new wire run last year, didn’t have a problem last year after I ran it. But when I started the system up after winter a few didn’t work. I replaced them and a few weeks went by and I have 4 more that need to be replaced. I get a voltage reading around 13v when I check the voltage at the solenoid. Thanks for your help. I would suggest checking the resistance of the solenoid. It should be between 22ohm to 50ohm. If it’s too low, that means the solenoid has a shorting somewhere and should be replaced. Very interesting article. Instead of boost circuit, would it be possible to use pwm arduino output and vary the duty cycle after a few seconds ? It may be possible. In that case, the power circuit can provide a stable high voltage (like 24VDC) and the microcontroller uses PWM to reduce the effective voltage after the valve is energized. I have never tried this before and it’s worth investigating. The main technical challenge is that this requires PWM output per zone, and Arduino doesn’t have that many pins that provide PWM output. The 500mA 24 VAC power supply I bought from OpenSprinkler last month tries to open the valves, but can’t quite. I have Orbit valves, and I’m swinging by Home Depot to buy their power supply, rated at 750mA. Do you ever get this failure? I was thinking about getting a capacitor to see if that’d help first, but local ones are smaller than what I was hoping to use. Thoughts? Hi Barry, 500mA should be able to power at least a couple of valves simultaneously. 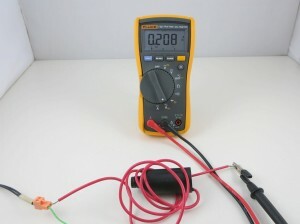 If you have a multimeter, check the resistance on the two wires of the solenoid. It should be between 22 to 50ohm. If it’s too low, that means your solenoid is shorted somewhere and that could explain why the adapter can’t power the valve. Also, just to make sure, your Orbit valve is rated 24VAC, right? Orbit also makes latching solenoid valves that should never be powered by AC adapter. It’s definitely 24VAC. I have a spare valve, and on my workbench, I can FEEL it latch for a second, then drop out. I’m going to call Orbit and dig some more, but I’ve now got a lot of $ wrapped up in grass seed, and if I don’t get it fixed, I’m going to have to buy an Orbit controller. I figured the $80-ish Orbit 12 zone controller wouldn’t be too expensive to try, so I did. It worked. I’d still like to replace it with OSPi, but maybe when I get a chance, I’ll take it apart and see what they used for relays on their board, and compare specs. Sprinkler controllers almost universally use triacs and not relays to switch solenoids. Relays certainly would work just fine, but they are more bulky, expensive, and slow to switch. I have a Leit 2 solar controller that seems to have died but the nerd in me wants to know for sure. It uses latching relays which can be tested by momentarily connecting them to a 9V battery, reversing the polarity will close the valves. I tested the solenoids this way and can switch the valves on and off with no problem. Placing a multimeter in DCV mode across the controller wires i can see a momentary voltage spike but it doesn’t catch the peak voltage. Do I need a oscilloscope to capture the peak voltage and perhaps current too? I would expect to see 9 volts peak, do i need to worry about the current? I would assume if the voltage is low the current would be low too… and of course do you know how low the voltage can go and still work latching solenoids? Hi so me and my coworkers have been doing some retrofitting. We’re working with Superior Brass Inlet valves and they all use a standard 24V solenoid. Long story short the main clock is no longer working so we’ve been installing portable Hunter Node’s the single station series. Normally they are used on a latching DC solenoid on those plastic hunter valves. We’ve butting cutting off the latching solenoid and attaching it to the Superior 24v solenoids. To get the node to work we used round magnets either on top or under the solenoid, were still experimenting since were using diff types of magnets, double sided and different pull lbs. Rather than dig out and replumb and replace the Superior valves with those Plastic hunter ones, the magnet retrofit has worked for the most part. Is there a better way to get the Nodes to work with the Superior solenoids, I know it’s a DC node trying to power an AC solenoid, is there a special solenoid or different portable clock out there or is the Magnet trick the way to go. Any info is appreciated. I am not sure. I’ve seen that Orbit makes valves that accept both DC latching and 24VAC solenoids. So if one solenoid goes bad, you can get either DC latching or 24VAC solenoids to replace it. I would assume Hunter’s solenoid design also provides this flexibility, but if you are trying to fit a solenoid of a different brand, that’s a totally different story. Hi thanks for the feedback, we were using the same solenoids from the Superior valves and retrofitting them to work with the hunter nodes. I ended up finding these universal DC solenoids! that fit on the Superior valves and come with their own magnet and work with the hunter nodes. Thanks for all your valuable advice. I’ve recently had a drip system installed as part of a Hunter total 4-valve system used to irrigate my lawn and plants. The problem I have is that the external drip valve vibrates when on, and it transmits the vibrations to the pipes inside the house and it gets quite noisy. The valve is a new brass Champion 24VAC. While checking the voltage at the controller, I found that the input voltage is 34V (no-load) and when turned on, the voltage drops to 32.5V and each station while running gets about 31V. Could this be causing the rattling of the drip system? The other valves are noisy but do not vibrate as the new one. Is the higher voltage the problem or is there anything else that you can think of? I’m trying to use a sprinkler control valve to shut off a cold water supply pipe in the event of a 120V AC power outage (to avoid possible overflow of an AC powered bathroom drainage pump system). As it needs to remain on indefinitely (except during power failures), I’d like to minimize power usage — perhaps by using DC low voltage (~9v?) with a DC latching type solenoid. But as it’s a permanent installation, I want to power it from the 120V circuit to avoid need for battery changes. Is there a simple, inexpensive set up you could recommend to do this? Awesome article, precisely the info I was looking for and the only place I could find it! I have a solenoid that makes a clicking sound approximately once every second. I have proper voltage at the controller on the zone terminal. I can also measure approximately 26 volts at the valve when the solenoid wires are disconnected but once I connect the solenoid it starts clicking and voltage fluctuates too quick to measure. The solenoid coil checked out ok good but I tried a new just to be sure and I still have the same problem. Try another solenoid and see if it’s the same symptom. Sorry, you’ve got to type in English. I am struggling with my watering system. 5 zones with 5 rainbird dv-100 valves(24vac). The original rainbird computer died and i would like to change the setup to work with my Fibaro Home Center (z-wave domotica). One component fibaro offers is a RGBW controller which can work with 12-24 volt (dc only). Would any 12 vdc power supply be ok? Any requirement on Ampere and wattage? Maybe a stupid question but i am not familiar with electronics..
12VDC is fine: technically it’s a bit high for providing the holding current required by sprinkler solenoids. That can potentially shorten the lifespan of the solenoids, but there hasn’t been any principled study about this. The OpenSprinikler DC-powered version uses an innovative circuit design that drives sprinkler solenoids with DC-only voltage. It solves the problem of solenoids requiring high impulse current vs. low holding current, but using a boost converter internally to generate high impulse voltage and lowering it to input voltage to provide holding current. Hopefully not too outlandish of a question. You can run multiple zones at the same time: it depends on the output current of the transformer. If the current rating is low, the transformer may not be able to supply enough current to keep many valves on at the same time. I have an Intermatic T8845PV timer that runs off 120VAC with a transformer that should put out 24VAC going to a solenoid that runs off 24VAC as well. My problem is that when I checked the power coming out of the transformer I’m getting 29.3VAC. Will that be too much voltage to the solenoid and eventually burn it up, or is that okay seeing as there’s no load on it? Once it sends power to the solenoid will the voltage drop? Thanks in advance. It should be ok: AC transformers are not regulated so typically output higher voltage when there is no load. As soon as circuit or solenoid draws current from it, the voltage will drop to 24 to 26 volt range. 1 amp should be sufficient. Ultimately it depends on the current rating of the valve, but 1 amp is plenty for a typical valve. I have an ancient irrigation system,@1980. Each of the four zones is activated by a switch, same as one would use to turn on/off an overhead light. To the best of my knowledge there is no transformer in the system. Is it possible that the old solenoids operate off normal house current. If that is the case, then I assume replacing a bad valve with a Rain Bird CP100 (24VAC) would be an exercise in futility. Any thoughts? (carefully) check the voltage at the solenoid itself and replace with appropriate unit. Good morning, my QUESTION IS About 24 VAC Hunter Solenoid Activation, I want to Activate Solenoids With A Transformer Directly For Testing, But WHEN I connect the transformer to the 24 VAC Hunter Solenoid, it starts to Turn On and Off Quickly Until I remove the Power, then I put a bridge of diodes and function normally, why does this happen if the valve is VAC? I am worried that since the relay is switching 240VAC at 30 amps and fairly pricey, that I really need a relay with a compatible RELAY coil specification that is similar to the Orbit AC relay in your write up above) .. can you point me to a High current capacity relay compatible with this application? I think the Swimming pool motor I am trying to control from the Orbit H-hyve smart Timer app is 1.5 HP at 220vac. You can use a 24VAC relay, or a solid state relay. Station 2 wouldnt work. When i pulled wire out of station 2 on timer and attached to number one station the zone came on and the timer started to smoke then zone turned off. Possible faulty solenoid? Probably shorted solenoid. You can measure the resistance on the two wires of the solenoid, typical 24VAC solenoids have resistance value about 20 to 50 ohm. Thank you, Ray! I’ve been enjoying your articles. Looking to put in a drip control system and have been researching open/hack/DIY options. Yours looks exceptionally good! Just received my OpenSprinkler bee and I have it hooked up to an existing system which used 24vac output voltage. Everything is working fine except when I activate a zone I can hear the solenoid lift momentarily but the valve does not stay open. Seems like it needs more current to keep the valve open. Any tips? Make sure you use sufficiently thick wires as the wire resistance can be significant in limiting the current flow. If it’s still not solved, you can go to opensprinkler.com and open a support ticket. While reading your very informative article I had an idea to enhance 12V DC usage in combination with 24V AC valves. Why not simply use a resistor with 27 Ohm in series and parallel to this resistor a 1000 uF 16V capacity (electrolytic capacitor). This will allow to give the valve the right high energy impulse at the beginning, but reduces afterwards once the capacity gets loaded the voltage to U/2. I just tested my idea and it looks to work fine. Well, I would think the resistor is going to dissipate power and that’s less ideal than using a resistor-less solution. When I have power and moisture together I am mindful of corrosion. Moisture and DC may result in electrolysis corrosion, using AC instead corrodes for one half cycle and restores it on the other polarity swing. If the AC is perfectly balanced then there should be no corrosion unlike using DC. Keep it dry but that’s hard to do in this environment year after year. Are you referring to soil moisture sensor? Here there is no exposed wire or lead, so I don’t see how corrosion matters. I try to use a 24VAC RainBird Valve (model 100-HV-MM), so, the first step is to try it with 24VAC, but I am surprise about the noise of the valve when it is powered. 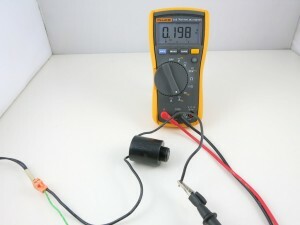 The resistance value about 80 ohm, current is 0.2A (@30VAC). 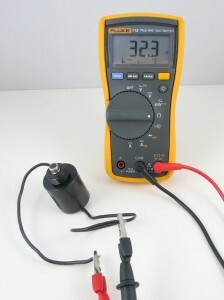 The “real” voltage is 30VAC, but it is the same with 24VAC (real 24VAC). The sheme is simple : 240VAC to 30VAC (10VA transformer) 30VAC connected to the valve. For the moment, I don’t have pipe and water pressure to make a real conditions test. I want to powered with 24VAC in order to use my valve for a long time and the solenoid is made for VAC voltage (and I have read comments in this (very useful page). All should be simple but something looks strange, what’s wrong in my simple use case ? AC is indeed noisy, so that’s expected. If the coil resistance measures 80ohm, 12V is slightly on the low side, you can go up to 15V, to provide 0.2A holding current. Thank you for replying, but in my case, I use 30AC, it works, but do you think the noise when valve is operated is OK, or it could be a problem for a long-term use ? As you said, “electrically the valves are designed to work with 24V AC”. Yes, 30VAC is fine — these valves are designed to handle a pretty wide range of voltages. Also, AC adapters are un-regulated, so if you measure 30VAC without load, it will probably drop to close to 24VAC when the valve is actually drawing current from it. This looks like the place I should ask why does my Galcon DC 6S (2×9V) cyclic mist timer only work at minimum 12 seconds on DC latching solenoids when it is set for any seconds less : 1 second = 12 seconds / 5 seconds = 12 seconds, etc? Residual magnetism ? But I’m using it at an off grid mist propagation facility for fruit tree cuttings. So 1 second every 2½ minutes would do, or 5 seconds every 3 or 5 minutes, but it’s not a reliable hack. The unit is supposed to do 1, 2 ,3 ,4, 5… or any seconds per any minutes during the daylight operational window. Are there DC non-latching solenoids I should be looking for ? Are DC systems not designed for intermittent mist ? My AC one works fine at home on AC solenoids. I’m trying to figure out problems in my 20-zone system. I think the controller is dead. Can I use a 24v ac transformer to directly connect to the common wire and the wire to specific zone to determine if the zone’s solenoid works properly? I have disconnected all zone wires from the non-working controller and now have access to the individual wires to each solenoid. Yes you can connect 24VAC between COM and any individual zone wire, and that zone should turn on, if the zone solenoid is good.